Affenitaet was developed by some German guys but don’t worry; you can switch the language to English once you start the game to experience the full pleasure of this very good game . The platformer gives you control of what I assume is a monkey (it’s brown and waves it’s arms a lot) and tests you through thirteen challenging levels (as well as a tutorial and bonus stage) where you must fill your pockets with as many coins as you can scrounge. However, it’s not as plain and simple as I’ve just made it sound; said monkey has some kind of special ability glowy thing where basically it attracts purple things and repels yellow things. 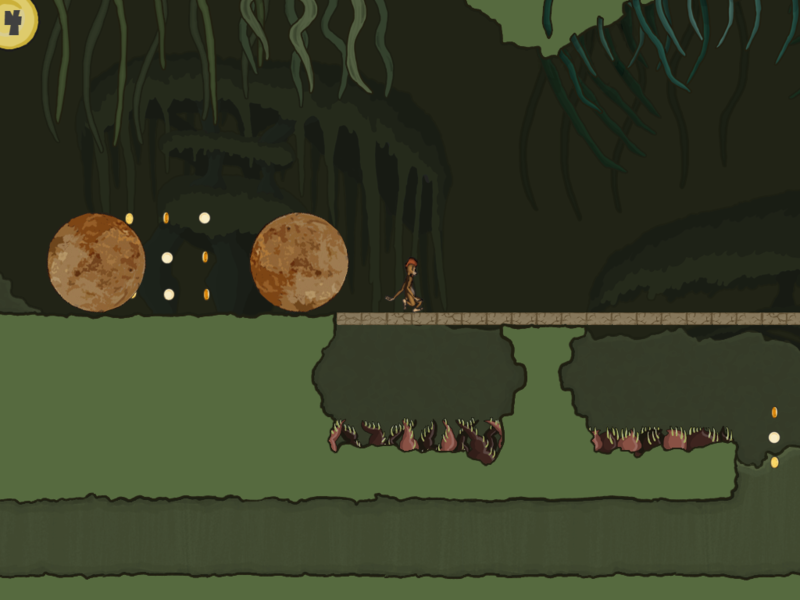 This mechanic is used wonderfully to produce fun and challenging level design. For instance, you can crawl along purple-laid ceilings above horrifying spikes and you can super-hop from yellow crystal to yellow crystal to avoid more horrifying spikes. Yes, you’ll spend a lot of time working out how to traverse spikes (oh, and boulders); some levels require good hand-eye co-ordination whereas some are more puzzle-based. This combination gives a great mixture which keeps this from becoming staler than the out-of-date bread in my bread bin. Oh, wait; I forgot something – the controls. Now, controls are an important feature of any game and I don’t think I need to explain why and sadly this is where I have a bit of a problem. You jump with the space key, you move with the left/right keys (unless you’re using an Xbox controller, you lucky sod) but you trigger the special ability with the CRTL key. My fingers didn’t really appreciate the awkward hand position. That and the sometimes glitchy movement affected the experience for me (not too much, but it did). Let’s move on to the visual side of things. Well what can I say? It looks brilliant. The hand drawn style mixed with the great use of colour and environment make this a pleasure to rest my eyes upon. The animation is top notch, too; rarely have I seen a Game Maker game let the player stand, walk and jump so realistically and smoothly. The menu also looks very fitting and altogether Affenitaet is presented rather brilliantly. I can’t complain about the audio either. The sound effects are frequent, varied and apt and although there’s no music in-game, the music on the title screen is well-fitted to the tribal atmosphere and introduces the feel of the platformer perfectly, even if I would like it to loop (okay, I complained). To sum it up, you should really play Affenitaet. If you like platformers (everyone, right? ), you should enjoy the level design and well-worked atmosphere and there’s even a tiny bit of humour in there. Beware though, this platformer is not easy; most people should see that as more reason to download it than a warning, though. Have fun. I don’t see the relation between being developed by German fellows and being any good or not. Are you really serious, or just tried to be “funny” by throwing some immature jokes? I didn’t think the controls were too awkward although they did take some getting used to. I thought the wide range of puzzles that need to be solved in order to collect the coins was interesting and because it wasn’t all the same I was happy to keep playing for a while – even if I couldn’t get to all the coins sometimes. I really thought the different colours attract/repel concept was very good. I think its pretty awesome, but i want to hear what the other mods think first. Great review and a great game. The game got some new original ideas i like, i will ask what the other moderators on YYG think. Are you going to feature it on YYG? What do the announcements mean? Our Opinions.